Dr. Mohammad Shahbazi, interim dean of the JSU School of Public Health, said the nation focuses too much on treatment rather than prevention. He’s joined by Erin Shirley Orey, left, board secretary for the Drs. Aaron and Ollye Shirley Foundation; Primus Wheeler, CEO of the Jackson Medical Mall Foundation; and JSU President William B. Bynum Jr.
Jackson State University said $1.8 million allocated recently by legislators to the School of Public Health (SPH) should help in the fight to eliminate health disparities even as many Americans’ lives are being cut short despite improvements in public health. 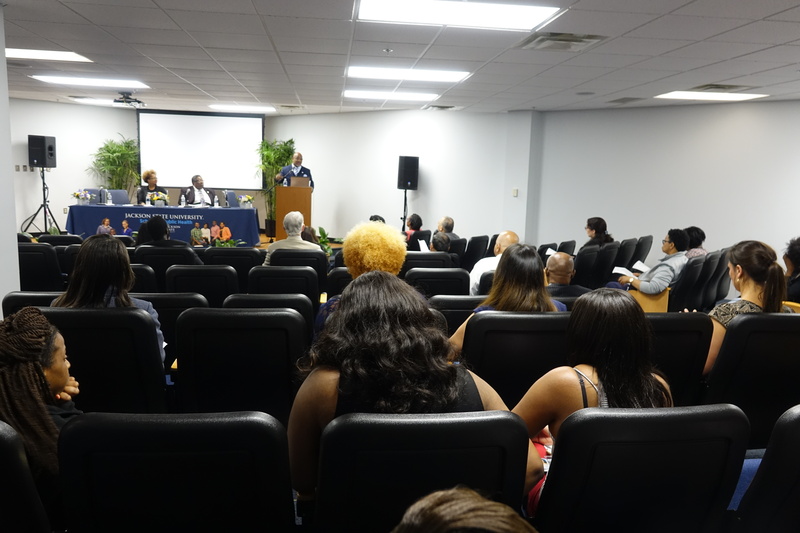 JSU President William B. Bynum Jr. made the announcement as he joined a group during National Public Health Week to discuss illnesses related to disparities and racism. 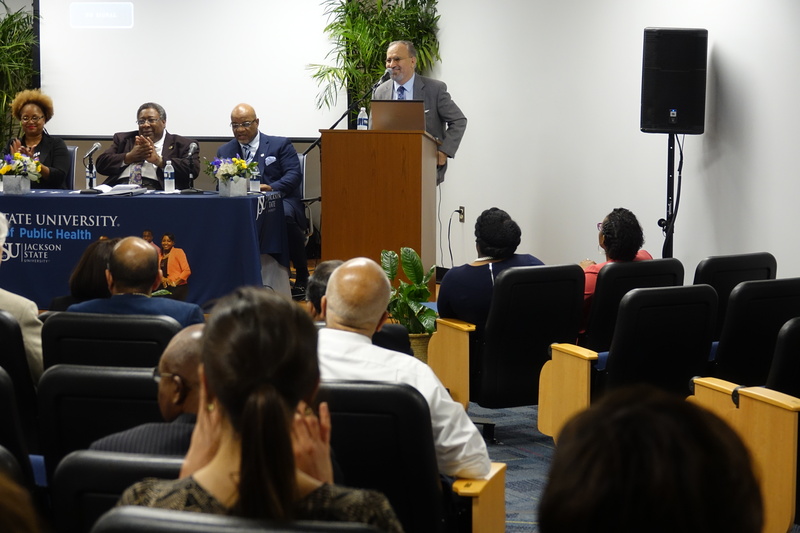 The SPH panelists also addressed social determinants of health during the forum Tuesday at the Jackson Medical Mall. Dr. Mohammad Shahbazi, interim dean of SPH, expressed grave concern over the state’s predicament. “It doesn’t make any sense that some people in Mississippi live 10 fewer years than others in the U.S., or in Mississippi, in general. There are issues of racism, social determinants of health and many other factors,” he said. Shahbazi touted the benefits of partnerships in solving many of the health disparities. He especially noted JSU’s relationships with state leaders and the significant role of the Jackson Medical Mall Foundation (JMMF). Primus Wheeler, CEO OF JMMF, discussed the impact of social determinants of health and how the foundation is contributing to mitigate the negative impact on people’s well-being. “We rank 34th in life expectancy; we need to work together to make sure we do better and improve our overall well-being.” — JSU President William B. Bynum Jr. “Our mission is to improve health and wealth outcomes. The Jackson Medical Mall has positioned itself as a source for providing a holistic approach to health care for the underserved. It promotes community and economic development in the Jackson Medical Mall district. We are extremely proud to house the School of Public Health,” he said. Wheeler said ZIP codes determine everything positive and negative about a person’s life, and he credits Dr. Aaron Shirley for spearheading efforts to rebuild and rebrand the 39213 ZIP code area, where the mall is located. Shirley, who died in 2014, was a pediatrician and civil rights activist. Also, he had been chairman of the board for JMMF. Although Shirley and other stakeholders created a place that provided health care and other human and cultural services, they ventured to build a place “for folks to work, shop and play,” Wheeler said. Using his medical background, Shirley’s vision became a reality in 1995, when he helped form a world-class class health-care facility and established successful partnerships with JSU, Tougaloo College and the University of Mississippi Medical Center. Shirley and his partners brought the mall for $2.8 million, and now it’s reportedly valued at $83 million. “If Mississippi spent more to educate children, we could cut health-care costs. We would likely have more jobs and access to nutrition and acquire knowledge and skills to quality health care.” — Erin Shirley Orey, daughter of renowned civil rights activist and longtime educatorDaughter Erin Shirley Orey told the audience that her parents fought for quality health care and education. Her mother, Dr. Ollye Shirley, had been a longtime educator. She died in 2016. Shirley Orey is the board secretary for the Drs. Aaron and Ollye Shirley Foundation. She’s also a business analyst at Aptean, a software company. She said Mississippi is still plagued by racism, health disparities and social determinants of health. Also, she said the state must invest in its young people. “If Mississippi spent more to educate children, we could cut health-care costs. We would likely have more jobs and access to nutrition and acquire knowledge and skills to quality health care,” she said. Despite many of the existing problems, Bynum remains optimistic.